I’ve tried very hard to cut down on the amount of food we bought for Christmas this year so that we didn’t end up with lots of leftover food. I had a few things left over, and here’s what I did to use them up. 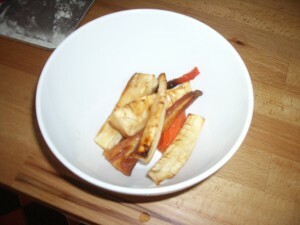 We a few roasted parsnips and carrots left from Christmas lunch. I chopped these up and I added them to a carrot based soup for lunch yesterday. I also had some batter left over from the Yorkshire puddings. Normally I would have thrown it out, but I put it in the fridge and tonight cooked a second batch of Yorkshire puddings. I’ve frozen these – I don’t know if it will work out ok, but I thought it was worth a try rather than waste the rest of the batter. We also had two portions of sticky toffee pudding and some sauce. I put these in the fridge and we had them yesterday evening as well. The leftover meat was eaten cold with salad, and there is a small amount over which will go into sandwiches in the next couple of days. How have you been using up your Christmas leftovers? We planned our leftovers to make sure we could have some sausage and stuffing toasties on Boxing Day. And they were delicious! The toastie maker cost less than £5 and we love it for weekend treats, tiny bit of filling makes a great lunch teamed up with some veg soup.